Multidots has a new office – biggger, better & beautifulll! Multidots has a new office – bigger, better & beautifull! Yippee! You probably couldn’t imagine how happy we are to share with you that Multidots has a brand new office in the center of the Ahmedabad city. Back in May 2012, when we had our ‘vision for the year’ meeting, we decided one point in our agenda to focus on increasing bandwidth. It was important for us to realize the need for better premises, as the place where we were working was a residential home, converted into Multidots office, and at some point, improvement had no scope. 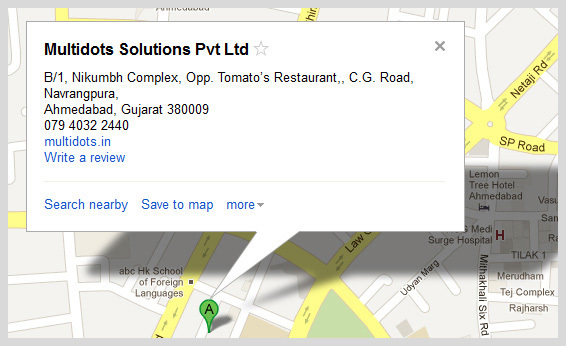 So we decided to move and finally on 16th October 2012, we moved to our new office at Nikumbh Complex. When we started Multidots, we never thought we will have an office on C.G. road (well off C.G.road) as, if we consider Gujarat as vibrant state for Business, and Ahmedabad as model city for Gujarat’s growth, Bodyline cross road can be considered as epicenter of the vibrancy. And what a place this is to be at. On right hand side, we have Law garden filled with colleges, Indian traditional dress market and a traditional mall National handloom. On our left, we have C.G road, which can be considered as the growth path. Ahmedabad is known for two routes; Ashram road, leading to Gandhiji’s Ashram, which is considered as India’s route to peace, and C.G road, which is India’s path to prosperity. The Nikumbh complex, where our office is located, gives a feeling of ancient Indian palace, and faces a row of beautiful green trees. One more reason for having the office at proper business location is, it provides opportunity to run operations smoother and cheaper. We have more stable and uninterrupted internet connectivity. All locally popular hardware vendors are nearby. So any failure can be resolved almost immediately. We now have more organized and optimized network system, server setup, energy-efficient equipment setup that we have planted with our own hands and creative minds. One of the biggest obstacles to getting large project for Multidots earlier was security, lack of a solid system of which had cost us in losing very important and potentially our flagship projects. In the new office, we have got a large hall with no limitations of internal walls. This helped in designing workstations, cabins and server room. So we now have a dedicated server room, a network with internal automated security system and monitoring tools patrolling important code and data of clients. The new office has impacted productivity of team by many means. For example, we now have enough leg space and quick-internal-meeting spaces, divided into partitions, so whenever a project team meets for any agenda, other teams can work without any disturbance. We now have enough space for our stand up meetings and sessions. Clean and dedicated space for pantry has allowed us to setup equipment like water purifier, water cooler etc. It feels great to see Aslam Multani (CTO of Multidots) in his own cabin finally. There are few vacant spaces which reminds us to pause writing this and prepare for recruitment, as this was just a milestone; we are going to reach our destination for the year soon when we meet team size of 50 soldiers in our team to lead Multidots, lead the nation and surmount obstacles coming in the way. We would like to heartily thank everyone for their support to help us achieve this new Multidots office. 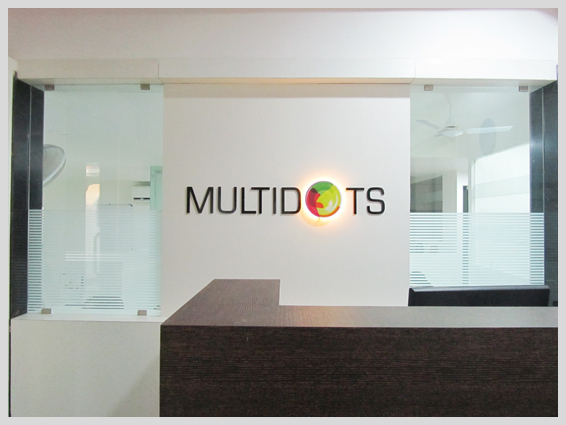 It feels like a dream come true to have an exclusive office that becomes a symbol of growth and success of each dot here at Multidots. With such a state-of-the-art office infrastructure and efficient IT setup, we look forward to offering our world-class web development, web design and mobile application services with more value additions, to our existing as well as prospective clients worldwide. Here, we present with all our pleasure, a glimpse of our new office; we hope you will love it as much as we do. Please share your feelings, feedback and suggestions for the new office, we really count on it. Thanks Kartik! Indeed, it’s ravishing. My best wishes with multidots always..! Thank you very much Shailesh for your kind wishes. We are waiting for you to have a visit to the new office. It will be an pleasure. Thank you very much Dinesh! Thanks Matt! I am very grateful for your wishes. Thanks Jignesh 🙂 When will you visit? Thank you very much Khusbuben!!! Highly appreciate for BIG THINKING. Always THINK AHEAD & PUT IN ACTION Immediately. Once again Congratulation to all staff member. We pray to GOD for Bright future ahead. Thank you so much for your wishes and blessings. We are very much eager to welcome you in the new office. Such a Beautiful environment and nice place for work. Congratulations anil and Aslam. Excellent… Best wishes with you…….